We will always remember Pup-Pup, a senior girl – at least 13 years old dropped off at animal control by the only family she’d ever had. 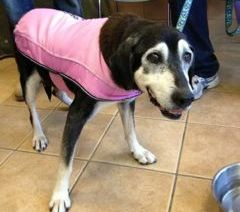 Our wonderful rescue friends in NJ stepped in to help us save her and she headed to New Jersey. We got to see the most amazing videos of this sweet girl coming back to life – and being loved nonstop. She went into a foster home and the family was thrilled. They stopped by to show the rescue her new jacked and how proud she was — but just a couple of days later she passed and everyone shared in the loss. We found out that the foster family went to the rescue after her death to officially sign her adoption papers. They wanted everyone to know she was their girl. We celebrate the chance of a lifetime that this girl had with a family to love her unconditionally and we all hold a piece of Pup-Pup in our hearts.